Treasury Minister Nicolás Dujovne and Central Bank chief Federico Sturzenegger hail productive meetings at joint press conference marking end of key G20 meeting in Buenos Aires. 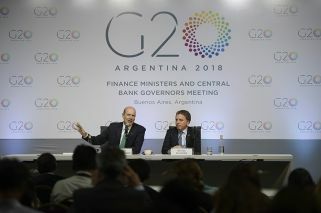 Treasury Minister Nicolás Dujovne and Central Bank chief Federico Sturzenegger hailed two days of “productive” meetings at a joint press conference this afternoon marking the end of a key G20 meeting in Buenos Aires, despite the event’s focus being drawn by US tariffs on aluminium and steel and Argentina’s push for an exemption from the duties. “The spirit of discussion was productive and everyone left very pleased and satisfied,” declared Sturzenegger, as he addressed reporters at the Buenos Aires Exhibition and Convention Centre (CEC) in Recoleta. The Central Bank chief emphasised the “very rich” and “intense” level of debate, praising the “constructive” and “coordinated spirit” that was “prevalent in the agenda" at the meeting of G20 finance ministers and central bank governors. However, both Argentine officials and visiting US Treasury Secretary Steven Mnuchin – in his own subsequent press conference that followed the host nation's – faced repeated questions about Buenos Aires’ bid to persuade US President Donald Trump to exclude Argentine firms from the new duties, with the topic dominating proceedings. Just a few weeks ago, Trump signed an executive order slapping tariffs of 25 percent on imported steel and 10 percent on aluminum imports, raising the spectre of an international trade war. Argentine firms, in particular, will be hit hard by the move – in 2015, the country exported US$320 million and US$493 million of aluminium and steel respectively to the US. “The first session was to discuss precisely that [the tariffs] and the feeling that I have was that there was a very constructive and cooperative spirit, with an awareness from all the players to work towards international trade,” Sturzenegger said. “Trade is good for all countries and we have to deepen it in a way that is a win-win situation for all,” he added. “We have not talked about a trade war,” he added, saying there was no expectations of such an event occuring. Mnuchkin was bullish in his statements later, saying the US was "not afraid of a trade war," though he added it wasn't Washington's "goal." 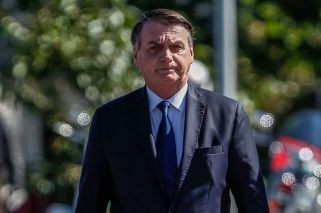 Quizzed about the long-trailed free-trade deal between the Mercosur bloc and the European Union and their status, Dujovne said he was “optimistic” that objective would be attained soon and said a next round of meetings is scheduled for April. However, French Finance Minister Bruno Le Maire had said during the first day of the summit that talks were "blocked" for "different reasons." "You cannot explain to a producer that he has to stick to very constraining rules in Germany, France, Spain or Italy, and we'll [import] exactly the same good that will not be produced in the same manner on another continent," he said in comments reported by Reuters yesterday. Le Maire later backtracked on his comments, saying there were "sensitivities" that needed to be addressed. Less than half an hour before the Argentine press conference took place, the event’s final communiqué – a statement agreed upon by all the G20’s representatives – was published. Despite the lack of references to trade in the final document, it was clear the subject on the minds of most. Earlier in the day, before his departure, Spain’s Economy Minister Román Escolano had broken ground yesterday to criticise US protectionism, saying that most countries share the "belief that protectionism is a huge historical mistake." The minister also emphasised that the international community should resolve trade disputes at the World Trade Organisation. “Despite its importance, a persistent infrastructure financing gap remains. Public financing of infrastructure is essential but mobilising additional private capital is needed to meet global infrastructure needs,” it continued. Otherwise, as Dujovne and Sturzenegger confirmed in their press conference, the text of the final document stuck mostly to the ideas laid out at the G20’s Hamburg summit last year – except for one area. The new addition to the event’s agenda and resulting communiqué was a reference to the debate over crypto-currencies, such as bitcoin. The officials closed by saying they agreed to “implement the Financial Action Task Force (FATF) standards as they apply to crypto assets." Officials had generally fallen into two camps during the talks, Sturzenegger said at the press conference, one group seeking regulation and the other asking why existing forms of payment had created a niche for the arrival of new forms. The Central Bank chief said there was a “demand” for specific recommendations to be made in the future, most likely in July at the third meeting of central bank governors and finance ministers. Sturzenegger said that the G20 should not shy away from debating crypto-currencies. “Presiding over the G20 is one of the greatest challenges in our history. We have taken it on with pride and humility. We do it as honest brokers, promoting consensus and dialogue,” he said in a short speech to officials. In an audio recording from the closed-door meeting, shared with reporters, Macri made a few light-hearted jokes, contrasting Russia’s recent declarations of its nuclear arsenal with Argentina’s own “secret weapon” – tourism. He then asked International Monetary Fund chief Christine Lagarde how her trip to visit the Iguazú Falls was. "By the way Cristina, how was your visit to the Falls?" he asked, making a slight slip-up on the name and raising the spectre of former president Cristina Fernández de Kirchner.